Those of you that have had a sandwich similar to this before already know how magical these flavor combinations are, but there are probably some of you who are thinking that these ingredients couldn’t possibly work. About 10 years ago, I was a nay-sayer as well until I felt adventurous one day and tried a sandwich like this at a restaurant/bar in Boston, MA called the Kinsale (aka home of the after-work drink for people working in Government Center). There’s just something about sweet ingredients and pork that work extremely well. 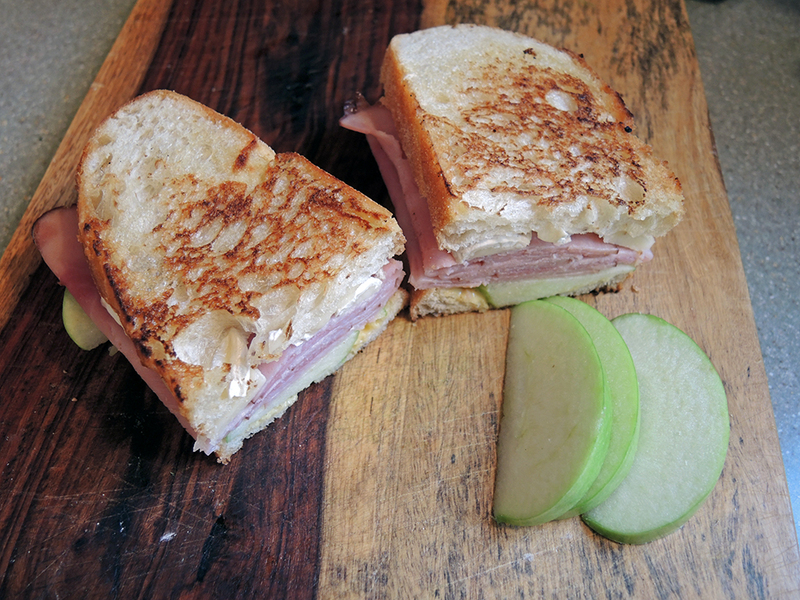 The apples and honey mustard provide the mildly sweet flavors to complement the natural sweetness of the ham, but the apples also provide a great texture in the middle of the sandwich. 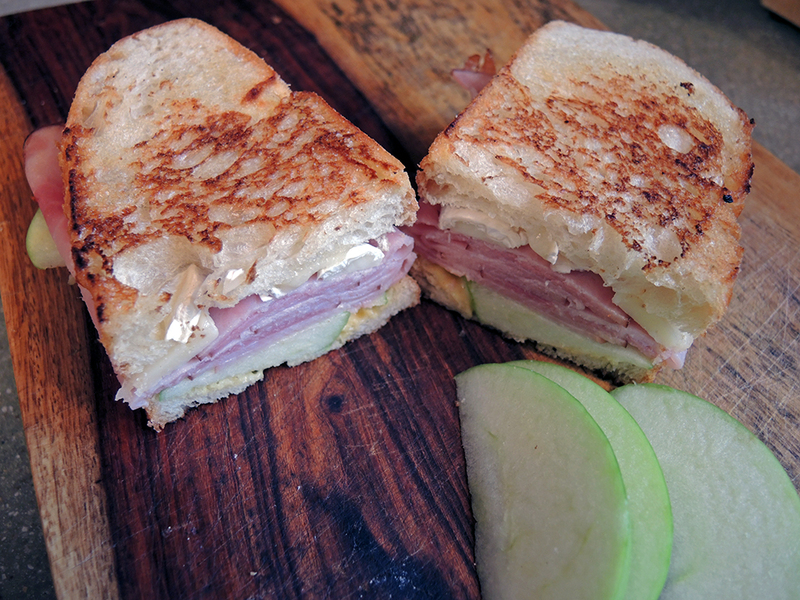 It’s no surprise that the ham and brie work well together (ham and cheese is classic), but the sweet flavors contrast the slightly bitter notes of the mild brie. Every bite is a perfect balance of sweet and savory. Add in some crusty or toasted bread and you’ve got a sandwich worth writing about (see what I did there?)! Makes 1 good size sandwich at about 592 calories. Note: You can skip the toasting steps in the directions and try this on a french baguette as well. Looking to cut some calories? 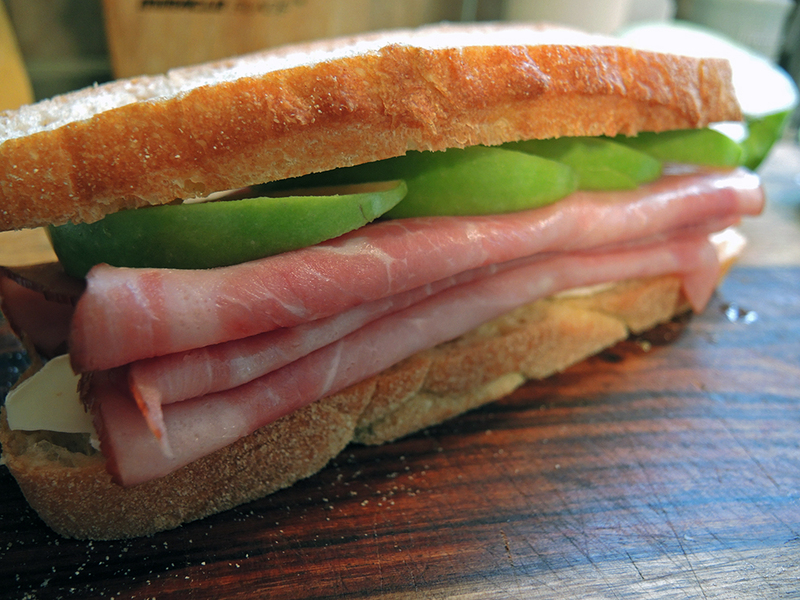 Try some light sliced sandwich bread from the grocery store. It all works! 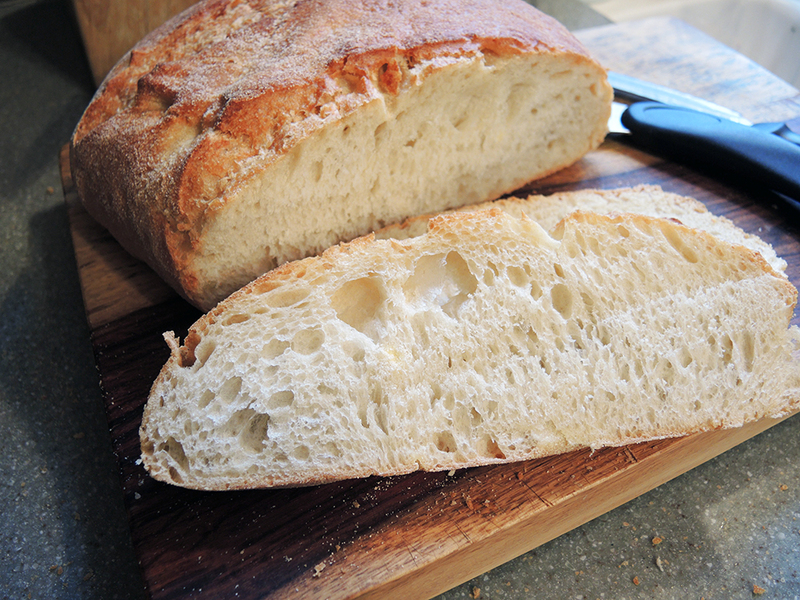 If it isn’t already sliced, cut two medium to thin slices of bread. Slice 1.5 oz. of brie into thin pieces and lay them on one of the slices of break. Layer the ham over the brie. 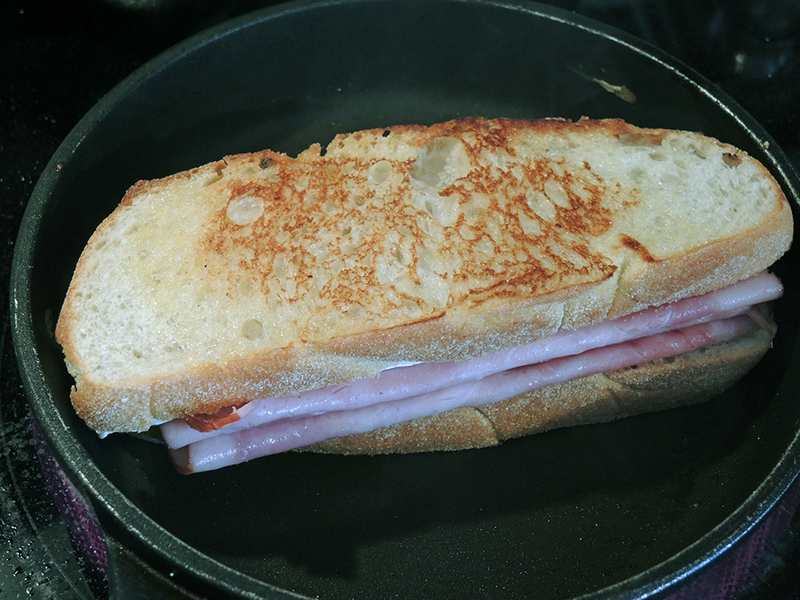 Try to fold the ham in half or in thirds rather than just laying it flat on the bread. That helps add some texture and height to the sandwich. 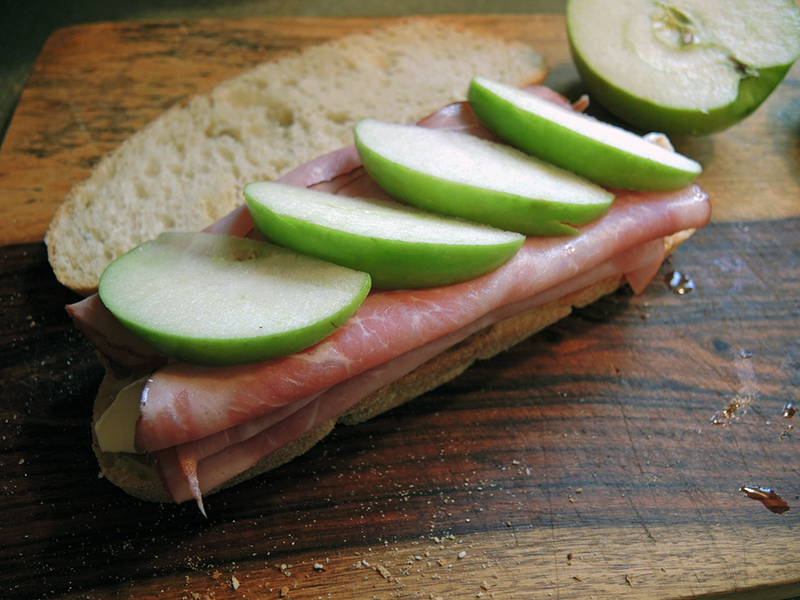 Slice up 1/4 of a green Granny Smith Apple into 4 slices and lay them on top of the ham. Spread 1.5 teaspoons of your favorite honey mustard sauce on the other slice of bread and complete the sandwich by laying it over the apples with the honey mustard side down (I know how obvious that sounds, but you would be surprised by some of things I’ve seen people do). At this point you could just eat the sandwich and have a delicious time of it, but I highly recommend toasting it up before you dig in. 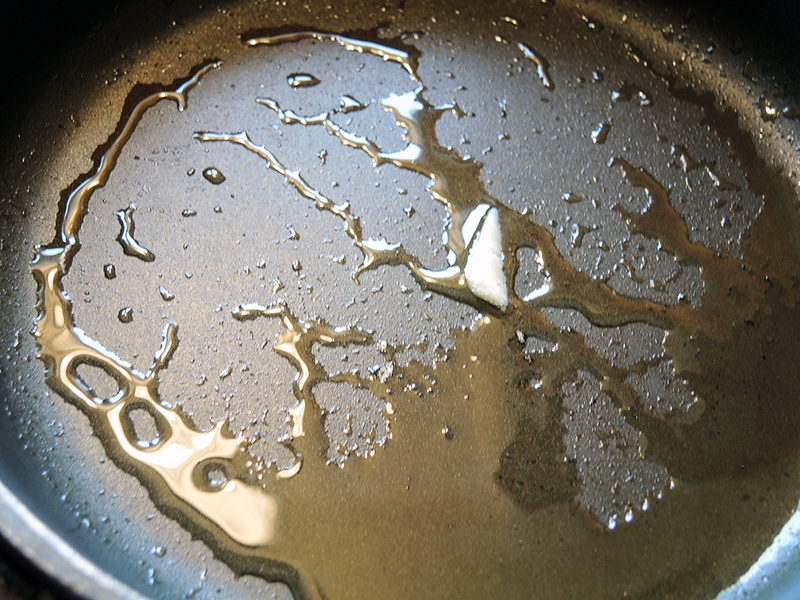 In order to do that, get the frying pan up to medium-high heat and place 1 teaspoon of butter in the pan to melt. Once melted, carefully place the sandwich on the pan and let that side of the sandwich soak up some of the butter. What I like to do at this point is after a few seconds of pushing the bread around to make sure it’s buttered, I remove it from the pan. Then I add in the other teaspoon of butter and melt that. Flip the sandwich over (carefully!) and then put the un-buttered side down on the pan so that it also gets buttered. I like to do this because by the time one side is toasted and you add another piece of butter to the already hot pan after the fact, the butter can brown really quickly and you get one side of the sandwich looking uglier than the other side. An even easier way if you’re not feeling lazy like me is to melt some butter in a small bowl in the microwave and then use a basting brush to just butter the bread before even putting it in the pan. After toasting one side of the sandwich for around 3 – 4 minutes, carefully flip the sandwich using a spatula and toast the other side. If the sandwich doesn’t look toasted enough to your liking when you flip it, just flip it back over for another minute or two. After toasting, set the sandwich down on a cutting board or plate and slice it in half if you want or just start eating right away once the sandwich has cooled a little. If you’re feeling generous, share half a sandwich with a loved one or your nemesis to get a new loved one. Don’t forget about the rest of that apple! Eat is as a side or dessert with the sandwich. A wonderful combination. Reminds me of summer. wow, man this is what i really need for my breakfast!!! i’m ready to perform wisdom tooth removal surgery then….